As previously seen, Luna in particular and the central Pickets in general are much more difficult to reach than the northern and southern Pickets, making them possibly the toughest dayhikes in the lower 48. The standard “Access Creek” approach is truly grim: after 17.5 miles of almost-flat trail around Ross Lake and up Big Beaver Creek, it leaves leaves the trail to swamp-whack down to Big Beaver Creek at the invisible junction with “Access Creek,” crosses on logs (if you’re lucky), then follows the steep creek through a couple miles of underbrush and boulders to reach the alpine. While the popular approaches from the south (Goodell Creek) and north (Perfect Pass) have fairly well-established use trails, Access Creek sees little traffic, and remains in a state of Forest Primeval. With a good forecast and too much rest, it was time to head back in and get the job done. Having procured suitable nutrition (8 packs of pop-tarts and a bag of corn nuts) and listening material (Fatboy Slim, Ministry, Rammstein, and hours of NPR), I set my alarm for stupid-early, and was on the trail down to Ross Dam at 2:35. With 2h30 of headlamp time, I expected reach the off-trail section with full light, and return well before full dark. Crossing the silent dam by headlamp was a bit spooky, but I was soon in more familiar night-time terrain on the other side, and put on an episode of “Ask Me Another” to pass the time. 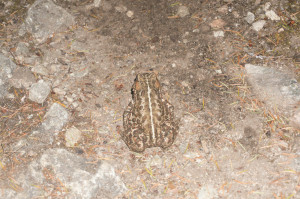 Spotting something reflective on the trail, I slowed to see what kind of night-time creature was crouched on the trail, expecting one of the little birds one sometimes sees in the Sierra. Instead, I found a fist-sized frog, which lazily hopped off to one side as I tried to get a decent picture. I saw several more of the creatures as I hike-jogged to the Big Beaver junction, passing the sign around 4:15. Between rusty legs and the slowness that comes with moving by headlamp, I was disappointingly slow reaching the cairn indicating roughly where to leave the trail, taking about 4 hours versus closer to 3h30 on my last outing. This log crossing totally goes! I put the legs back on my pants, then made the almost-familiar swamp-whack to the creek, once again emerging at some random spot with no sign of crossing logs or side-streams. After scouting upstream a bit, I returned downstream, reluctant to ford a wide stream of silty, uncertain depth. 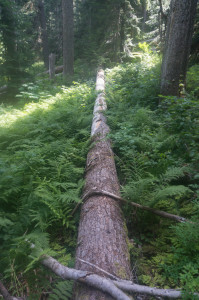 At a braided section I remembered from my previous outing, I realized that with one daring move, I could make a dry crossing on a series of four logs. The crux was to shimmy out onto some large alders, then make a 3-foot step from one slimy log to another, steadied by an alder on one side and the upturned root-ball of a snag on the other. A slip would result in a full-body soaking and probably a swim. Fortunately I avoided these things, and after four easy logs and an unnecessary foot dab, I was in the swamp on the other side, where I realized I was just upstream of Access Creek. The swamp ends remarkably quickly on this side, replaced by consistent blueberry underbrush as the stream climbs steeply away from the Big Beaver. I found occasional divots in the moss, indicating previous foot travel, but no trail, and resigned myself to the ‘schwack. Blueberries are fairly harmless as underbrush goes, but their stiff branches can still be hard on the shins. I eventually found myself on the spine of a ridge just north of the creek, where there almost seemed to be a faint trail. After an initial climb, the valley levels off again, and the terrain gradually changes, with open woods interspersed with swampy sections filled with berries and devil’s club. Eventually the slide paths begin, choked with denser vegetation and alders. Spotting an open boulderfield to the south, I crossed the creek at the first opportunity, tunneling through the alders on either side to reach open ground. From here, I tried as best I could to link boulderfields split by stripes of dense alder, pines, and berries, finding a few cairns as I made my way to the head of the valley. Luna was intermittently visible through the clouds ahead, so close, yet intimidatingly high and vertical from this side. From the route descriptions I had read, the route heads left up a steep gully to cross the ridge and reach Luna’s easy side. 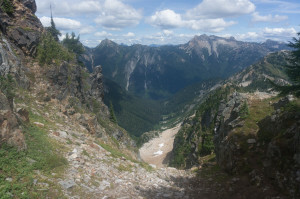 There are several such gullies, so I headed toward one near the valley head. Nearing the base, I realized that the permanent snowfield was unfamiliar from the route description, and boded ill for what was above. Traversing some steep dirt and heather to avoid backtracking, I tried the next gully left. 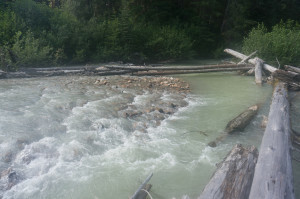 This started out “bearable,” with a third class version of the garbage normally found under snowfields, then got “serious.” After a somewhat desperate stem and grovel on wet, slimy rock around a chockstone, I decided that I wanted to be elsewhere. Exiting left again on steep heather, I rounded the corner and found the obviously correct gully below me. I found a place to traverse in, then followed the top part to the ridge. 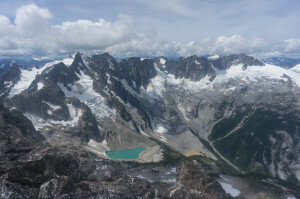 Finally, I was rewarded with the first part of the view I had come for: MacMillan Cirque, including the impressive north side of the southern Pickets. 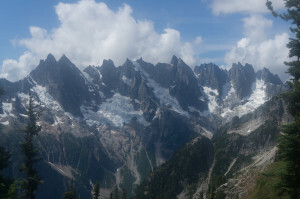 While these peaks are all short rock spires above a plain on the south, on the north they rise in an unbroken 4,000-foot wall of rock buttresses and steep glaciers. Side-hilling up and west on some steep heather, I rounded the corner to see Luna’s southeast face and easy southwest ridge. 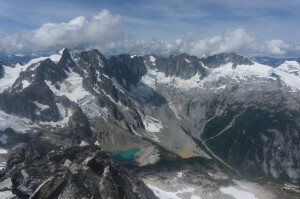 After some time edging across the steep heather, I headed straight up the face before a col on the ridge, scrambling up some easy third class slabs and steps to reach the broad talus ridge. As I climbed the ridge, Fury and the Luna Cirque gradually came into view, the former discouragingly far away, the latter depressingly deep and full of loose moraines. My hope to come at Fury via Perfect Pass was dimmed; Access Creek once again seems like the least-worst option. Topping out on Luna’s east summit, I had a full view of the two Pickets cirques together, and finally saw the final, exposed scramble to the true summit. While it looked loose and intimidating, it was actually fairly quick and painless, with sections that could be easily “balance-beamed” with a decent head for heights. Reaching the summit 9h40 out, I found a small register which went back less than a decade, and suggested that an average of 2-3 parties a year typically reach the summit. Many seem to tag Luna as part of a longer Pickets traverse, going in and/or out easier routes like Whatcom or Perfect Pass. 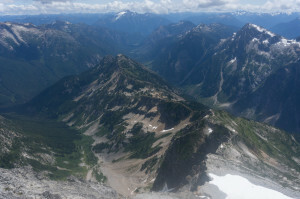 With plenty of flat rocks to lie on, I spent about 40 minutes on the summit, taking in the Pickets, Jack, Hozomeen, and a distressingly complete view of my long route back to Highway 20 at the base of Mount Ruth. Eventually, I put on my pack and started my stiff legs on the long road home. Making my way down the descent chute, I stopped to pick up a long piece of climber-trash, completely unnecessary on steep dirt and scree. Thinking I had found a better line to the boulder-fields, I stayed high at the base of the chute. This worked well initially, but proved to be a terrible mistake that cost me about an hour. The high shelf cliffs out in a mixture of steep slabs, random drop-offs, and steep gullies. I was slowly beaten back nearly to the base of the gully, cliffing out again and again. 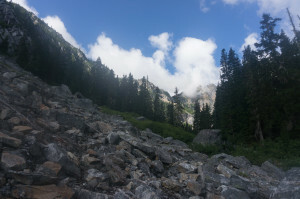 I finally forced a way through, taking a winding route through fourth class slabs and trees to reach the boulderfield. I was pissed at myself for wasting so much time, eager to reach the trail and turn off my brain. Rather than staying high on the boulderfields and bashing through the vegetation bands, I stayed low, following an apparent game trail near the stream before crossing north into the woods relatively high in the boulderfields. This was probably the faster way, as I found mostly open woods with decent game trails through the few slide paths. Below this, I intermittently found and lost bits of trail, getting on better and worse terrain as I bashed my way down toward the Big Beaver. It wasn’t pretty, but it worked, and I eventually reached my complicated log crossing. The crux was harder in this direction, and I was not in the mood for a bath, so I searched around for suitable wood, and eventually found a sort of board that made an almost perfect platform over the step-across. I was desensitized enough not to notice the swamp-bash back to the trail. Not having exerted myself in hours, and glad to be moving in miles per hour instead of hours per mile, I ran almost gleefully down the first part of the Big Beaver trail, then forced myself to keep up the pace out of habit and boredom between 39-mile camp and Ross Lake. I noticed some small things moving on the trail, and figured they were either crickets or hallucinations. However, in a strange echo of the morning, they turned out to be dozens of fingernail-sized frogs. I reached the sign in just under two hours, thoroughly beaten-down but pleased that I could finish at a fast walk with no evening headlamp. My episode of “This American Life” turned out to be a re-run, but that was interesting enough in my semi-dazed state. I ground out the final climb to the highway at dusk, rinsed off by headlamp, then crawled in the back of my car and passed out. This entry was posted in Type II fun, Washington. Bookmark the permalink.